Proles: George P. Bush, Noelle Bush, John Bush, Jr.
Jeb Bush (natus John Ellis Bush Midland in urbe Texiae die 11 Februarii 1953), praesidis Georgii H. W. Bush filius et Georgii W. Bush frater, est politicus Americanus. Alumnus est Academiae Phillipianae oppidi Andoveriae in Massachusetta et universitatis Texanae Austinopolitanae. Jeb Bush Floridae gubernator ab anno 1998 usque ad annum 2006 fuit. 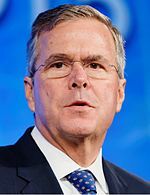 Die 17 Februarii 2015 Jeb Bush nuntiavit se candidatum electionibus praesidentialibus anno 2016 fore. Vicimedia Communia plura habent quae ad Jeb Bush spectant. Novissima mutatio die 10 Ianuarii 2019 hora 13:59 facta.